Greene Line Steamers originated as a family-owned and operated business established by Captain Gordon C. Greene and his wife, Captain Mary Greene. After working his way from deckhand to captain, Gordon Greene purchased his first steamboat with his own savings in 1890. The last years of the 19th century and first years of the 20th were prosperous for steamship lines, and the Greenes purchased several “packet” steamers which carried both passengers and freight. 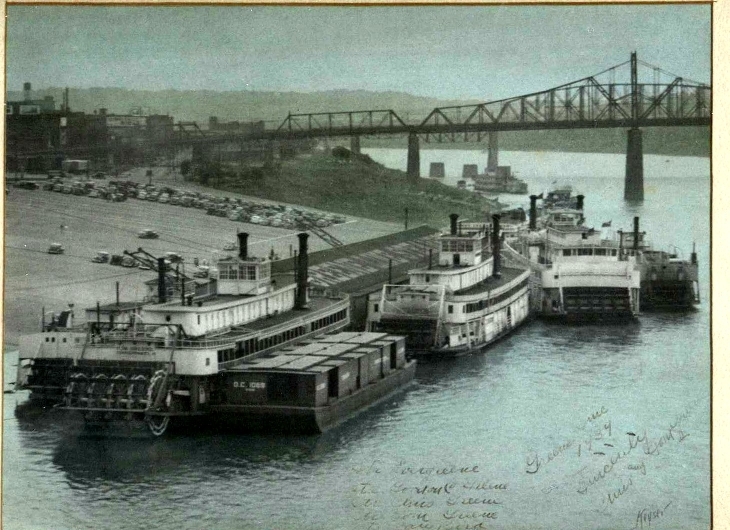 Their riverboats traveled on the Ohio River from the port at Cincinnati to Charleston, Pittsburgh, and other ports along the way, transporting agricultural products to the west and general goods to the east. In the 1920’s the railroads came to dominate freight transport, and many packet steamer companies folded. Greene Line Steamers, however, survived by building modern steamships which could carry more freight, by capitalizing on shorter trade routes, as well as by initiating passenger pleasure cruises. Though the business of pleasure cruising stalled during the Great Depression, the Greene Line’s freight business endured. 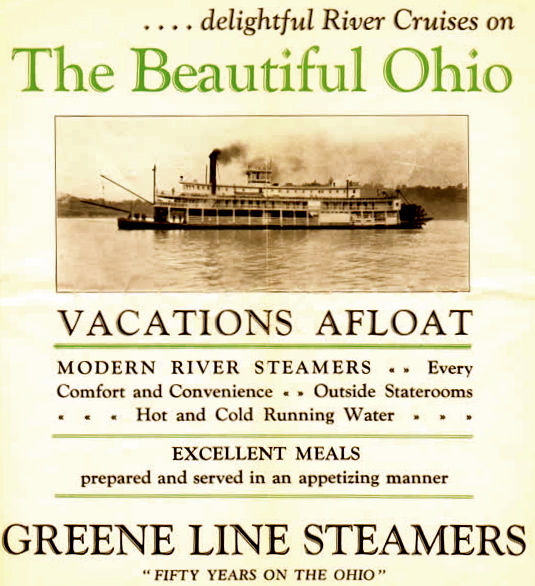 Greene Line Steamers directed a fleet of 26 steamboats when Captain Tom Greene, son, and successor of Gordon Greene, purchased the Delta Queen in 1946. 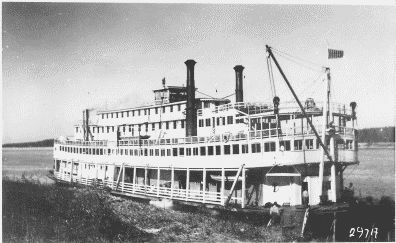 Since its inaugural voyage on June 1, 1927, the Delta Queen has become “legendary” as the last original overnight paddlewheel steamboat in full operation. Captain A.E. 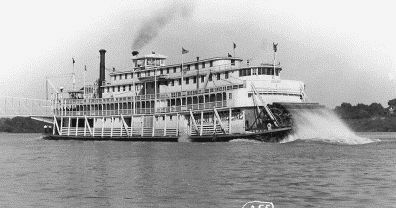 Anderson, head of the California Transportation Company (CTC), had reportedly defied conventional wisdom when he built the Delta Queen and its twin, the Delta King. They were the largest, most extravagant sternwheel riverboats of their time, built at a cost of $1 million each. A crystal chandelier, stained-glass windows, and a grand staircase with accents of Honduran mahogany and bronze filigree were just some of the adornments to grace the Delta Queen. 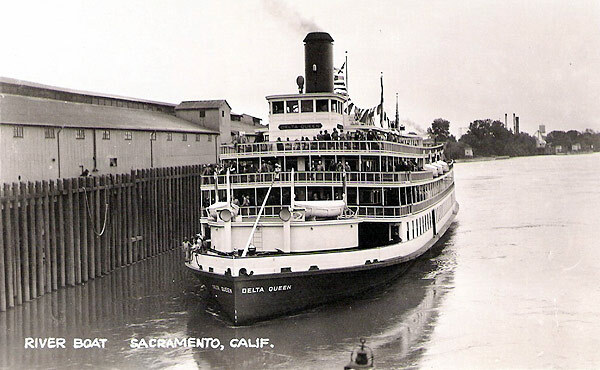 Though river transportation was in decline, CTC successfully operated both boats on the Sacramento River, offering “Luxury and Comfort Afloat” on overnight passages between San Francisco and Sacramento. After some years out of service during the Great Depression, the Delta Queen and Delta King were leased to the U.S. Navy in the late 1930’s for barracks, for naval training and, later, to be used to transport men wounded at Pearl Harbor from oceangoing vessels to military hospitals in San Francisco. Tom Greene’s vision to place the Delta Queen into operation on the Mississippi River faced many challenges. To transport the flat-bottomed boat without damage over rough ocean waters–from northern California, along the coast of Mexico, through the Panama Canal to New Orleans–the Delta Queen would have to be towed. Most of the mechanical parts were dismantled and wood planks were mounted on the external framework of the first two decks to protect the ship’s interior. The Delta Queen arrived safely in New Orleans on May 19, 1947, after a month-long voyage. 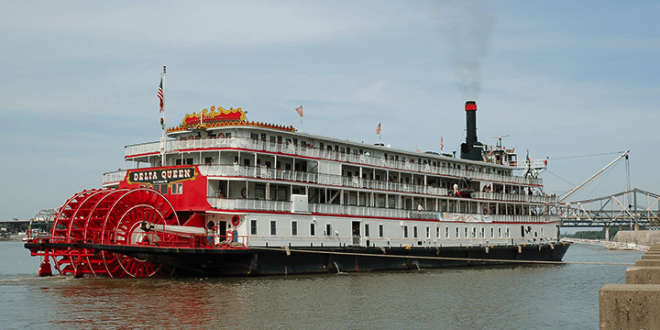 With the steamboat’s paddlewheel reinstalled and its steam engine realigned, the Delta Queen powered itself to the Dravo Shipyard in Pittsburgh for a complete refurbishment and overhaul. On June 30, 1948, the Delta Queen made its inaugural voyage under the banner of Greene Line Steamers from its port at Cincinnati. A variety of problems beset Greene Line Steamers in the following years. The company had incurred a large debt from the $750,000 renovation of the Delta Queen, while competition from the trucking industry reduced freight rates, exacerbating the company’s financial difficulties. Frequent engine problems on the Delta Queen were also a hindrance. The company eventually purchased internal mechanical components from the owner of the Delta King for use as replacement parts, including the paddlewheel shaft which was replaced in 1980. The fate of the Delta Queen and Greene Line Steamers changed unexpectedly with the involvement of Richard Simonton. Letha Greene had returned this man’s check for a reservation in early 1958 with a letter explaining that the company was going out of business. 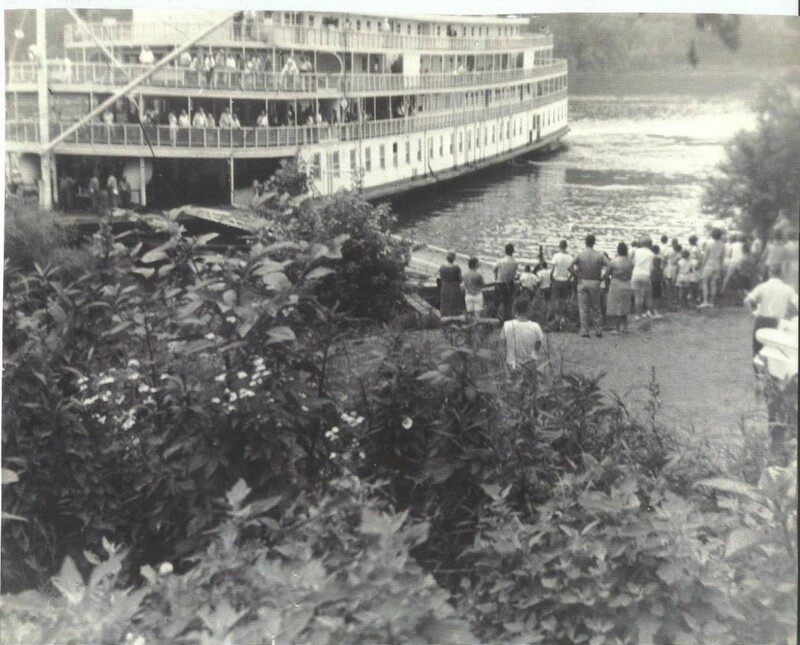 Simonton had relished a steamboat trip with his family the previous season and was disappointed to learn of the company’s imminent demise. Simonton rescued the company with a $25,000 loan, a $25,000 stock purchase, and the assumption of $70,000 of the company’s debt. His friend E. Jay Quinby was named the chairman of the board, with the primary responsibility for publicizing the company. The 1970’s brought many changes to Greene Line Steamers. 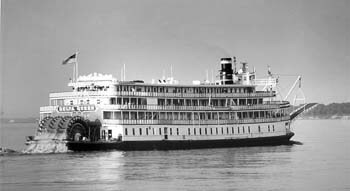 No longer a family-owned and -operated business, in 1973 the company changed its name to the Delta Queen Steamboat Company (DQSC) in honor of the Delta Queen. Previous: Canadian Pacific’s EMPRESS OF JAPAN had four lives.